Battle Of The Schwarzeneggers: New International TERMINATOR GENISYS Trailers | Warped Factor - Words in the Key of Geek. Well he did say he'd be back! 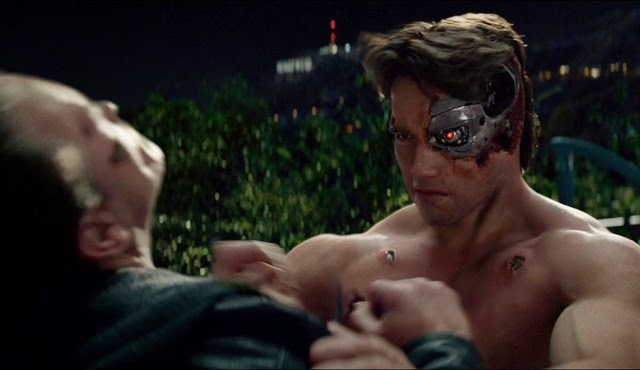 Paramount are hoping Terminator: Genisys proves to be a sizable global hit, and so they've released some exclusive trailers specifically for foreign shores which offer some new tantalising footage. Terminator: Genisys arrives in UK cinemas on July 3rd and two days earlier Stateside. It stars Emilia Clarke as Sarah Connor with (no relation) Jason Clarke playing her son John. Arnie is back as the aged Terminator, and in his first big Hollywood role it's Matt 'Doctor Who' Smith.